The Handleless Europe kitchen door design is very fashionable at the moment. The integrated handle creates a smooth, linear look. Handleless Europe kitchen doors and drawer fronts are made from 18mm MDF. This design is also available in 22mm thick MDF (called Gallo design). An alternative handleless door design is the Handleless Overton. 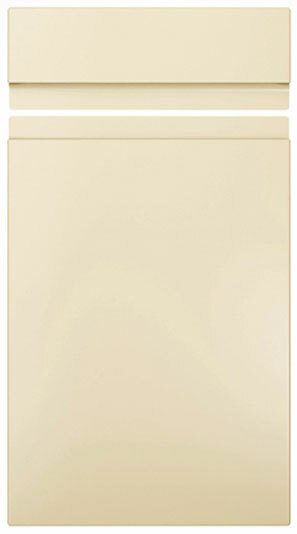 Handleless Europe drawer fronts start from £2.10. Click the button to purchase a Sample Premier Handleless Europe design kitchen door. The Premier Handleless Europe design is available in ALL non-gloss finishes. The Premier Handleless Europe design is available in ALL high gloss finishes. Please Note: The Premier Handleless Europe design is NOT available in any high gloss finishes.